WHAT: What you want. Your goals, dreams, and desires. 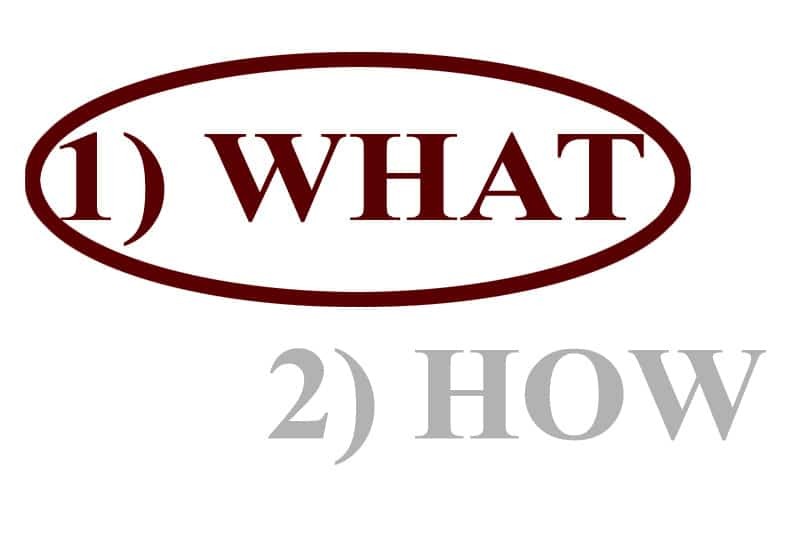 HOW: How to get what you want. Your methodologies, knowledge, techniques, skill sets, and action plan. The order to think about your goals is first WHAT, then HOW. First discover WHAT you want, then figure out HOW to get there. For example, say you are unhappy with your job. In this situation, what is your ideal scenario? This is your WHAT. Perhaps you want to set up a contemporary cafe where people can dine at and relax after a busy day. You want to turn this into one of the most popular cafes in town. In time to come, you want to open other branches across town, perhaps at one point turning it into an international chain. To achieve this WHAT, you need capital, knowledge, and experience. Your HOW is then to continue working in your day job for 6 more months to build up your savings. At the same time, you will start to connect with people in the cafe industry to learn from them. You will also be reading books to understand how to run a successful cafe business and gather the resources to get things started. Sounds simple when we break down our goals this way, huh? 😀 Unfortunately, most people get stuck. They either focus on the HOW first instead of the WHAT, or they are not clear of their WHAT. In my past year of coaching, I observed three common issues blocking people from getting what they want. Then there are people who are clear about their WHAT. They channel their energy into their WHAT and make big progress. The HOW is hardly an issue for them. There may be challenges here and there, but they always find some way to address them. When you are not working on your real WHAT, even though you achieve great results, you feel empty. For example, someone who makes big strides as a lawyer. He gets promoted to be the head of a law firm, but if what he truly loves is playing music, then there’s not much point in progressing as a lawyer. This was the case for me before I quit my corporate job. I was successfully building my career in brand management, but what I really wanted was to help others grow and live their best lives. Here, people have some idea what they want. However, since they do not see a way to get there, they compromise on their WHAT. They reduce their expectations, make do, or abandon their goals altogether. These people are ruled by practicality rather than their dreams. Over time, life becomes a matter of sacrificing their goals for others or going through the motions. Since they can’t achieve their WHAT, they stop thinking about it altogether. Some deny their dreams. Eventually they just forget about their WHAT. They become sleepwalkers of life. Uncovering your WHAT is the first step to living the life of your dreams. Your WHAT represents your big rocks in life. If you do not define your big rocks, the small rocks will take their place. These small rocks are the mundane day-to-day activities, time wasting tasks like checking Facebook, and other people’s goals. Unfortunately, most people do not think about their WHAT or they think about the HOW first without getting clear on their WHAT. Because they can’t figure out an easy HOW, they get intimidated by the idea of doing something different. So they think “Why bother?” and ignore their goals altogether. 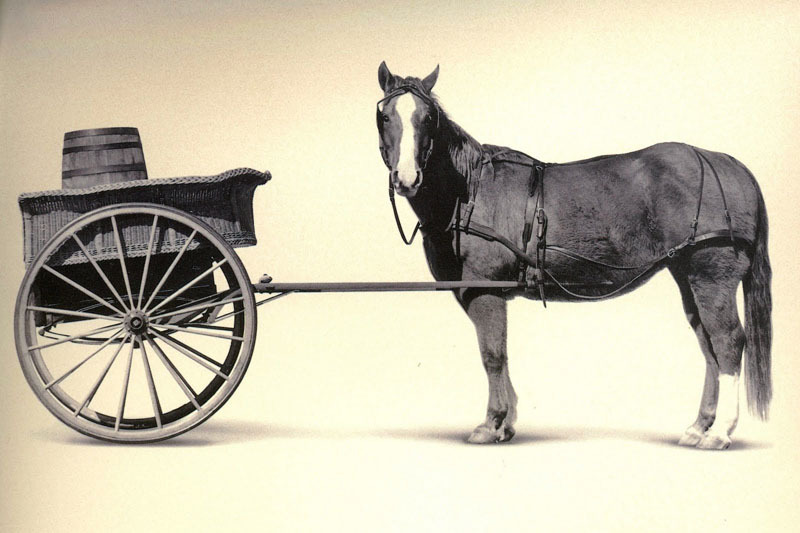 However, thinking about the HOW before figuring out the WHAT is like putting the cart before the horse. As you know, you can’t move a cart when it is placed before the horse. The horse needs to be in front to move the cart. Similarly, your WHAT needs to come before the HOW. Get clear about what you want first. Then, figure out how to get there! Donald Trump is quite a hated figure since the 2016 US presidential elections, but put your disdain for him (if any) aside for a second, because I think there is something to learn here. Before the elections, Donald Trump is widely known as the real estate mogul from The Apprentice. He was the CEO of Trump Organization, a prominent real estate and investment organization. However, there was a time in the 1990s when Trump’s bad decisions in business led him to a huge pitfall. Overnight, he turned from a billionaire to having nearly a billion dollars in debt. At that time, his “friends” and business associates left and turned their back on him. The media, press, and people around him thought he was finished. It was the lowest point of his life. Within a year, he turned around with over $3 billion in net worth — 3 times higher than his highest wealth from before his debt which was $1 billion. From a -$1 billion debt to being a billionaire again, three times over. It was such an incredible feat that he became listed in the Guinness Book of World Records for the biggest financial turnaround in history. When I was a second year student in university, we were supposed to secure internships for the summer holiday. At that time, there were many recruitment talks conducted by different companies in the campus. One of them was Procter & Gamble, a highly prestigious Fortune 100 company, renowned throughout campus. Everyone knew about its an arduous selection process and how only a small, pristine group of candidates would be recruited. No one knew the people who got it; it was such a small and elite group. So when they came to the campus for a recruitment talk, the lecture hall which had a capacity of 500 was filled to the brim. Seats were all filled, students were sitting on the walkway, and then there were those who stood at the back of the hall. Like everyone, I was interested to apply. There was only one problem — the competition. There was only a small number of roles open and nearly a thousand people looking to apply. Very smart, talented individuals, half of which were probably more qualified and experienced than me! For example, I was just a second year student while some candidates were third year or MBA students. They had more academic knowledge and internship experiences, and for the MBA students, past work experiences, while I had no internship or real work experience. Their track records were easily stronger than mine. There were also many second year individuals with their own achievements that made them very strong candidates as well. My odds were like 0.1%. Rather than be intimidated by that, I simply focused on the WHAT — getting the internship. I thought if I tried, I would have a chance of getting in. But if I didn’t, I would have zero chance of getting in. So I focused on doing my best at each stage of the hiring process. I drafted my best resume that showcased my skills and wrote my best cover letter. I meticulously filled out the application questionnaire survey. I began to get called back for each round. The rounds ranged from personality tests, to quantitative tests, to behavioral interviews. In each round, I simply focused on doing my best. In the end, I passed each round (6 in total) and secured the internship. I would proceed to do well and get a pre-placement job offer two years before graduation. This would never have happened if I had allowed myself to be overwhelmed by the negative odds, and given up on the goal. Instead, I focused on what I wanted (the internship), applied, and put my best foot forward at every stage. Doing so helped me secure the job in the end. It turned out to be a life-changing experience as I learned so much on the job, way more than in my two decades of education. What do YOU truly want for yourself? What are the biggest goals you want to achieve in your life? What are the things, when you achieve them, will bring you tremendous joy and happiness? What do you most wish to see happen in the next few years? Don’t just scan through these questions and casually answer them. Really think about WHAT you want. Remember, these are YOUR goals, not other people’s goals. By spending 10-15 minutes to really think about our goals, we can set the trajectory of our life in the right place. How was the exercise? What answers did you get? Now you know your WHAT, it doesn’t stop there. HOW do you intend to bring them to life? I have written many articles on goal achievement. Check out my articles in the Goal Achievement category. Devise an action plan to bring your WHAT to life.